Today, I defied the advice of many concerned friends and went to a Uygur neighborhood in Urumqi on the anniversary of last year’s ethnic riots; but I must admit, after learning more about the racial tension in Xinjiang, I walked around with some apprehension. I exhibited my tourist identity – a camera hanging down my neck, spotting a colorful tubular buff as headwear, and speaking in limited Uygur language that I picked up in the past week. But what difference would that make? In the eyes of the locals, I would be a Han Chinese tourist from another province. Oddly enough, when I walked down a lane with many roadside stalls and stopped to buy some cookies from a Uygur vendor, the middle-aged woman asked if I was a journalist. Perhaps, no Han would have any business to stroll down a street full of Uygur, and with security forces in every corner. 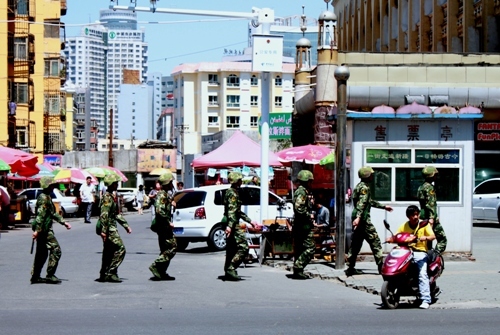 Armed personnel patrol the streets of Urumqi diligently. Instead of taking me to a restaurant that served Xinjiang signature dishes like roasted whole lamb, grill meat or pulou rice, a few acquaintances in Urumqi treated me to Sichuan hot pot yesterday. Initially I thought they were trying to please my Malaysian taste bud that preferred the hot and spicy southern Chinese cuisine, but later I was startled to learn of the real reason. “We are not treating you to typical Xinjiang food, because after last year’s incident, we have quit going to Uygur restaurant or eating Uygur food,” said Wang, a Han ethnic who is born and bred in Urumqi. I have arrived in the provincial capital of Xinjiang Uygur Minority Autonomous Region, Urumqi, just ahead of the anniversary of last year’s July 5 bloody ethnic riots, which left 197 dead and some 1,700 injured, according to official figure. Last year, what started as a street protest demanding investigations into a Uygur-Han brawl at a factory in southern China, had instead turned violent in Urumqi. The Turkic-speaking Muslim Uygur attacked and killed the Han, who is the biggest ethnic group in China, and eventually led to a bloody crackdown.